Britain's ONLY Pub Trade publication, The Publican's Moaning Advertiser (PMA) struggles with journalistic integrity at the best of times but recently has pushed its benchmark lower than ever into the basement of press standards. 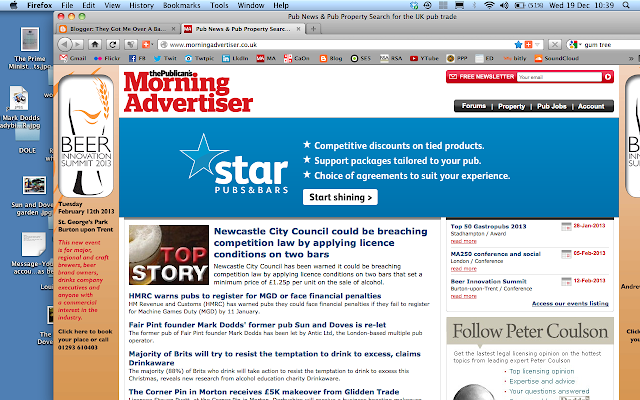 You might say that PMA's gone beyond the gutter and slipped right into the cellar of the pub trade. On 5 December PMA failed to report even one column centimetre on the British Beer and Pub Association's mauling in Committee Room 8 at the hands of sceptical MP's and Lords wanting to find out what improvements Pubco's have made to their unbelievably poor relationship with their tied tenants right across the UK. 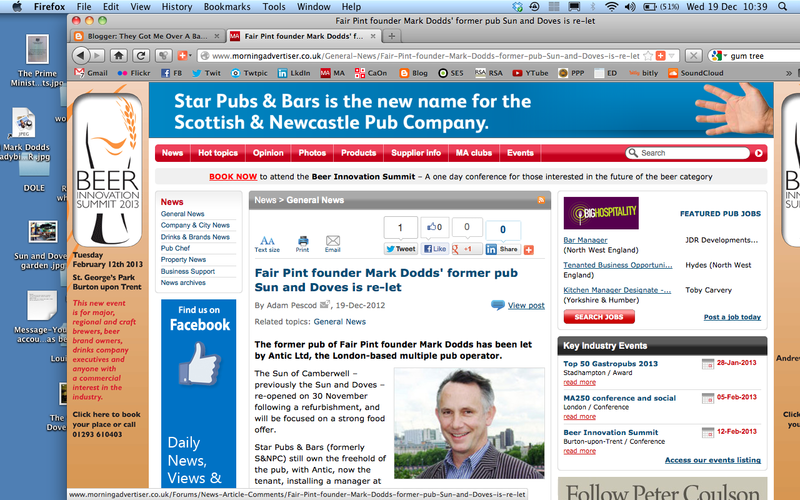 Not One Word of the volatile meeting, one of the most important events in the pub trade's calendar for 2012, was reported in the Pub Trade Press. I was critical of this shambles and warned off 'hijacking unrelated threads' with comments. Now they have blocked me from posting even on an article about me on their front page. At least they haven't the wit to go phone tapping. As of this morning we have disabled your PMA forum account. If you insist on breaking forum rules then I'm afraid you have left us with no choice. If you wish to contest this decision then please email Rob Willock with your reasons. Right now I have to go to Catford Job Centre to sign on and, as it happens, attend to a couple of other administrative things down the Dole Office, so I can't make the most of this little bit of news. When I saw this headline on the PMA I thought to make a neutral comment about the news but, of course, since I am banned from posting there due to 'breaking the rules' I can't do it. Your account has been temporary disabled. For more information, please contact an administrator. You have not yet explained why you blocked me from commenting on your esteemed publication, even though I asked well over 24 hours ago. Mr Berry's email states 'If you insist on breaking forum rules then I'm afraid you have left us with no choice' but to disable your account. As I have not insisted on breaking forum rules, nor intentionally broken them with any of my contributions, I am at a loss as to why you did this yesterday. It seems especially odd that you did this when today you published a piece about me and the pub I had a lease on for sixteen years on the PMA front page. It seems very odd. 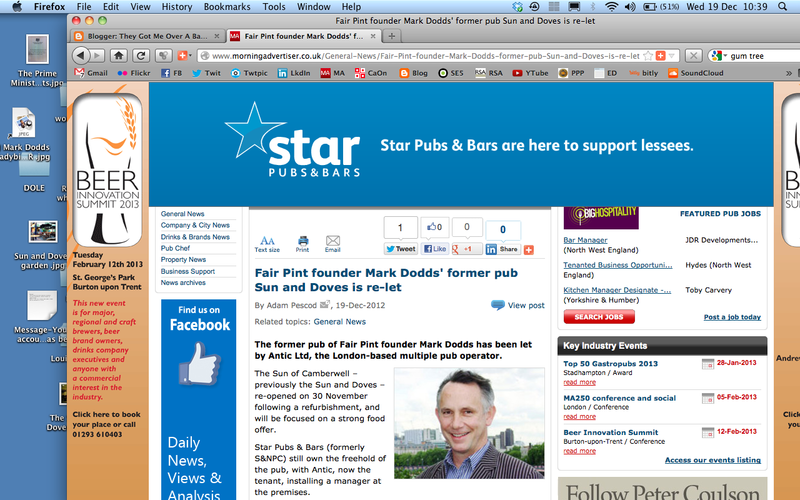 By the way, I see you used a photograph of me which I supplied your publication to illustrate a piece about the Fair Pint Campaign. You have not credited me with being the copyright holder. This oversight surely falls far beneath your normally exceptionally high journalistic standards. So now, I ask again: Please indicate which rule(s) I have insisted on breaking, or have actually broken - just to ease the confused mind of a poor, bankrupted former tied lessee and (homeless) Camberwell and Peckham resident. As circumstances would have it, I was invited to meet friends in the Sun this evening. Most enjoyable.